CalPERS, the nation’s largest public pension fund, manages both pensions and health benefits for more than 1.8 million California public employees, retirees, and their families. 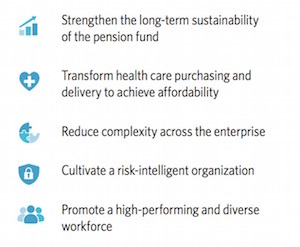 Every five years, the organization updates its strategic plan to address changes that have impacted fund management, health care costs, organizational complexity, and risk and workforce management. In July 2016, CalPERS hired BluePath Health for our strategy development skills and experience to lead the creation of its 2017 to 2022 strategic plan. During this 18-month engagement, we worked directly with CalPERS CEO, CIO and Board of Directors facilitating workshops to review the organization’s business planning process and results. We also engaged staff in workshops to review and address the same topics. Results included a revised five-year strategic plan with five goals addressing fund sustainability, health care affordability, organizational complexity, risk management and workforce development. We also developed 36 success measures to track progress over the life of the plan. These measures include tracking employer contribution rates, investment returns, access to primary and specialty health care, prevalence of diabetes diagnosis, benefit payment timeliness, total overhead cost, cyber security risk rating, and workforce diversity. “The ability we will have to measure our progress over time highlights the strength and maturity of the CalPERS organization and our drive to perform on behalf of our members,” said Marcie Frost, CalPERS chief executive officer in press release about the new plan.